A bar, an arcade or perhaps just a “barcade” if you want to sound cool, EightyTwo is quickly becoming a go-to hot spot for people near the Arts District in Little Tokyo who enjoy having a drink and playing video games under one roof. Are you of Gen-X or Y? This is the place to reminisce about your 70’s, 80’s and 90’s childhood. And when reminiscing, who doesn’t want to have a tasty alcoholic beverage (or three) in hand? When I stepped into EightyTwo I was met by a friendly bouncer in a suit who took my i.d. The entrance takes you to an open courtyard where people eat and take breaks from playing a Doctor Who pinball machine or Street Fighter game. 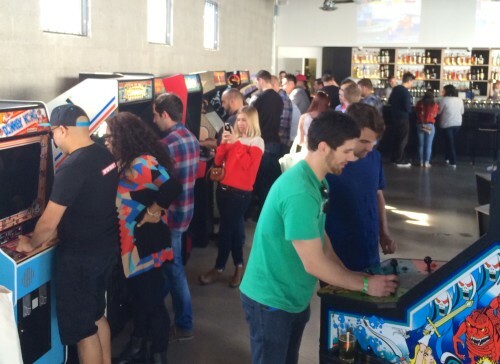 The bar features a rotating collection of 40 restored arcade and pin ball machines. Be forewarned, however, your gaming skills may or may not have been derailed by the delicious cocktails created behind the bar. Overall, on just one Saturday afternoon, it was clear to tell everyone was having a good time, relaxing, and the place was going to be packed by sunset. So Why The EightyTwo Arcade Bar? $0.25 games!!! Now, that is what I call a cheap walk down memory lane! (a couple will cost you $.0.50, but for most the quarter is standard). Sweet cup holders for your drinks at every arcade station. A very chill courtyard / patio area provides a relaxing ambience for a nice conversation (READ: good for first dates and ice breakers). There is a room entirely dedicated to pin ball machines. A DJ who spins cool sounds from the three era’s. On a Saturday afternoon a food truck was parked behind the courtyard. Unclear if that’s a permanent fixture or there is a rotating batch that take up that space (seems to be a trend with new places opening up in the Arts District). The drinks are like every other hip establishment, not the cheapest. Guess that is the price of nostalgia. Still a good vibe and worth checking out.